We will match any competitor’s price on comparable equipment. We want you as a customer for life. Successful bed bug heat treatments utilize convected, heated air, directed through and around the treatment area, so the heat penetrates all the objects in the room, bringing them to lethal temperatures. Heat reaches locations traditional chemical treatments cannot easily penetrate. GreenTech Heat has designed all our heaters to kill insect pests, and not appropriated equipment from other markets and uses. Each of our portable heat treatment packages includes everything your crew needs to successfully treat a typical treatment area in a day. Our propane heat treatment packages include Master Heat Technician Certification and Dr. Linford’s Heat Treatment Field Guide for maximum efficiency, and our flash video training at no additional cost. Camps use the Titan 800 to treat an occupied cabin in one day while the kids are away on day trek adventures. Because of the amounts of energy produced, propane-fired Titan heaters require someone onsite throughout the treatment actively monitoring temperatures and airflow. I wanted to tell you how very happy we are with your equipment. The two Titans perform excellent. 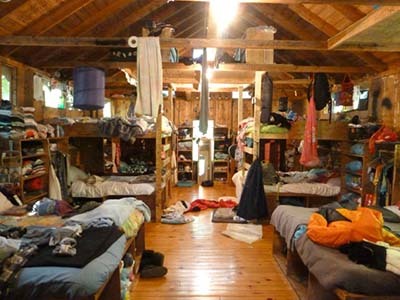 We can do a full treatment to our largest cabin even while the kids are on day trek adventures. And when they return no more bed bugs! Also, I want to say it works great for head lice, too! That’s a big one. We will be telling all our affiliate camps at our next rally how to once and for all take care of this problem. And no big demand on electrical power either. 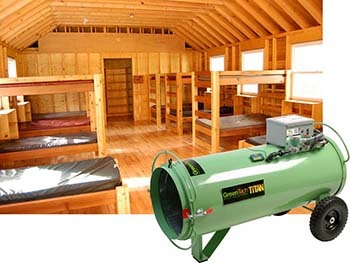 Titan portable direct-fired propane heaters are the most powerful heaters for GreenTech Heat treatments. 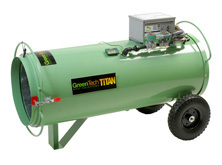 GreenTech Heat offers packages built around two propane heat systems: the Titan 450 and Titan 800. Both heaters are made in the USA. Portable propane bed bug heaters are typically operated outside the treatment area and the energy from the propane heating unit is ducted into the room from outside the building. Because of the amount of energy and heat produced by propane heaters, a technician must always be present to monitor the heater and the treatment area. Propane systems require a propane tank and hoses. Propane heaters achieve lethal thermal temperature faster than electric units and will take less time to perform a treatment. Bed bug heat treatments with propane heaters often reduce the ability for bed bugs and other insects to migrate out of the heating zone during the treatment. Direct-fired gas heaters are effective for treatment of all insects and are efficacious for all life cycle stages. The Titan heaters also raise interior and exterior wall temperatures to lethal levels for wood destroying pests like termites. All GreenTech Heat propane heaters come with a 2-year repair or replace warranty. Propane heat packages do not include the propane tank. Each of our propane heat packages comes standard with the Bed Bug Heat Treatment Field Guide and our exclusive Master Heat Technician Certification, and include fans, all propane hoses, and regulators. Click here for a listing of our propane heat treatment packages with the propane bed bug heater. 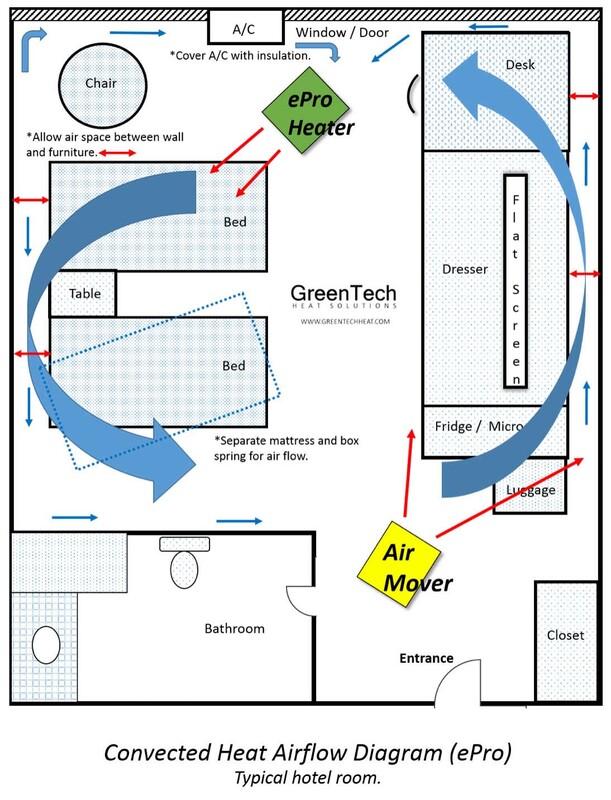 Because of the convected energies created by the GreenTech Heat heaters, we do not recommend residents re-enter the property until temperatures have cooled to 85°F. For a full discussion of bed bugs, their life cycle, bed bug detection and control, visit our bed bug page. The full details of heat treatments are provided in our Heat Treatment Field Guide. This is a basic approach to performing a heat treatment. The same process for treating bed bugs will also kill, and in some cases, completely eradicate other organisms. Regardless of the heat source, lethal temperatures and treatment exposure times must be achieved throughout the structure as measured at the hardest-to-heat location to achieve a 100% kill of your target organism. Heat systems affecting heat treatment run times and methodology. Electric bed bug heaters utilize a closed system. It operates from within the structure being treated with heat. Electric heat is slower in the beginning of the heating process than propane. With ePro electric heat systems, starting room temperatures raise by approximately 10°F in the inital hour. However, the ambient room air temperature will increase at an increasing rate as the room temperature rises and recycles itself through the electric heater. It is the multiplying effect of air recirculation within a closed system. Electric heat requires power sources. Adding more electric heaters will be more productive to your heat treatments. However, the power source may become a growing challenge. 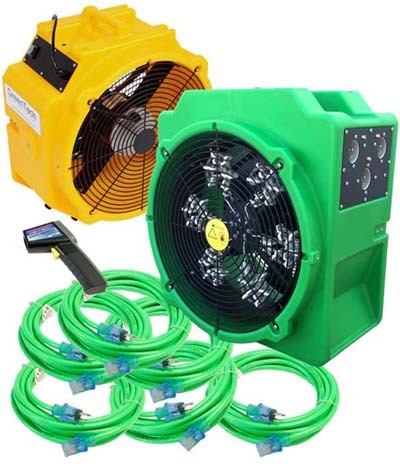 Each ePro electric heater is 120v and requires between 50 and 66 amps to run at 100% power. GreenTech portable Power Stations are used to plug into 240v power sources like an electric range or A/C outlet and can provide more 120v power to the ePro heaters. Check your available amperes. Propane bed bug heaters operate in an open system. The portable heating unit stays outside the structure and the heat is ducted into the building. It produces positive air pressure. The units require a source of propane to operate. Unlike electrical heaters, Titan propane heaters create an intense and immediate heating of the treatment area. Higher air output, higher volume of heated air, high productivity capabilities as compared to electric systems. Propane can be divided with splitting the heat ducting to cover more area, rooms, or even another unit. Propane treatments result in more thorough penetration and distribution of the heated air. Propane heaters tend to have faster treatment times or larger treatment areas. At first glance, it can appear there is a lot to understand about heat treatments! We’ve been developing and refining thermal pest control technology since the late 1980s and offer training and support unparalleled in the industry. Your success is our success. Please call our sales line at 855-GTH-BUGS (855-484-2847) for answers to any of your questions. We offer best-in-industry, 24/7 tech support to our clients and free shipping on all electric heat packages. All our fans and heaters come with a 2-year warranty. There are a few parameters to consider when estimating a treatment time. These potentialities are all addressed in our Master Heat Technician Certification training. Treatment area affects treatment times. The larger the area the longer heating time for all areas to reach lethal temperatures. The more nooks and crannies, the greater the compartmentalization and longer the treatment times. Building materials such as cement, brick, wood, steel, dry wall, etc., will affect the heating times. Cement floors and walls will take as much as three times longer because cement acts as a heat sink and will maintain cool temperatures longer, thus requiring more heating time. Furnishings affect airflow and heating times. Lots of furniture will require more run time due to the volume of material needing to get to temperature. Furniture is also an obstacle for the heated air to travel through and around. Clutter can be a detriment to a successful treatment. Piles of clothing and blankets are very important to move around and mix during the treatment. The room air temperatures can be 130°F, while the floor under the pile of clothing could be a cozy and not lethal 80°F. Bed bugs prefer dirty laundry. Clean up the clutter prior to the treatment. Weather can both positively and negatively affect treatment times. Treating for insects in a desert will require a shorter treatment time than when treating at a high altitude with snow and wind. Humidity and cold will take adjustments and more heat time. Degree of infestation dictates the degree of both the post-treatment cleanup and the attention needed during treatment setup. Identifying and treating infestations early is key to control and is much easier to get a 100% kill. If the infestation is large and mature — basically way over due for treatment — you will need to take time to move objects, furniture, open all draws and closets, and spend extra time prepping and allowing more time for longer heat penetration of the structure and furnishings. Ambient temperature defines your treatment’s starting point. This can have a similar affect as weather, but applies to interior room temperature. Is the treatment temperature beginning at, for example, 90°F or 40°F? Whenever practical, preheating the treatment area with the building’s HVAC can reduce treatment times. Preheating is not required to achieve lethal temperatures, but may decrease the treatment times for electrical treatments. All efforts should be taken to begin heating the structure during set-up of heat treatment equipment. Starting with a pre-heated room achieves faster arrival times for lethal temperature resulting in less treatment time, and higher productivity. A 10°F increase in room temperature prior to treating can eliminate an hour of treatment time. Every organism has a thermal death point and heat kills lots of pests. The death point data listed is from laboratory tests, not field applications. Using an ePro electric bed bug heater to treat a bedroom with two beds and other furniture — be it a residential bedroom, a dorm, or a hotel or motel room — will benefit from a strong setup and airflow. Get the heater turned on in the room and heating prior to moving furniture and formally beginning the treatment. Our Titan package is set to arrive Wednesday of this week. I want to thank you for taking the time to talk to me throughout the numerous conversations we have had. I first looked at your company about one year prior to making a decision to purchase from you, during that year we looked at several other options and found that you were not only the best bang for the buck but also the obvious choice in heat treatments. Your products & customer service has shown to be next to none in the pest control industry!! Modern bed bug populations are highly resistant to the insecticides used for their control. 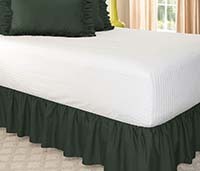 Bed bugs can be difficult to access and insecticides do not work as well as they once did. 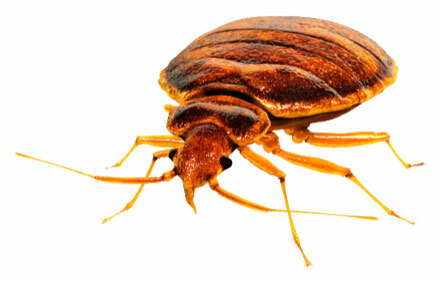 Heat is known to be a very effective bed bug killer and it can be used in many different ways to treat infestations. Heat treatments for bed bugs, cockroaches, moths, lice, spiders, and other insects are 100% safe for humans and pets. Our equipment will zapp bug and black widow with thermal remediation.